Floral arrangements, crystal chandeliers, and mirror elements created a striking setup for each of the functions at this couple’s wedding. 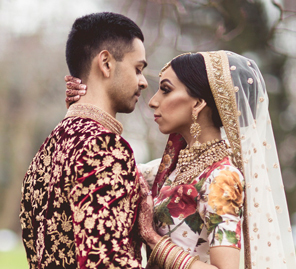 When Chandni and Dhiren met during a wedding little did they know it would lead them to their own. 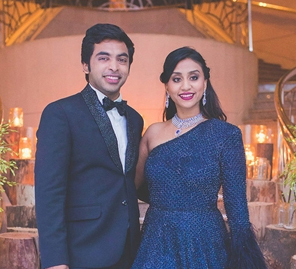 After being introduced to each other at Chandni’s cousin’s celebrations, four years later, these two lovebirds got married at Mayfair Banquets. 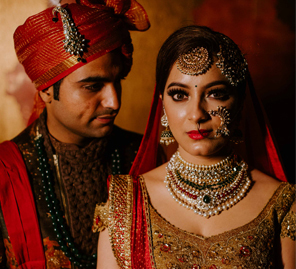 The bride shares details of the wedding which was beautifull captured by WeddingSutra Favourite Israni Photography below..
We met during the sangeet practices four years ago. It was love at first sight. During the dance sessions we would meet and talk and this went on until a few days before the wedding when Dhiren texted saying, “Date karegi kya?” I thought he was joking. But he wasn’t and everything just fell into place. Eventually our families were involved and they were thrilled since they’re already familiar with each other. On a birthday trip to Koh Samui, Dhiren proposed. A romantic evening, candlelit heart set up on the beach at sunset, he went down on one knee. Of course I said yes. It was the best birthday I’ve had so far. We celebrated our wedding across three different venues. The mehndi and mata ki chowki took place at Umang Banquets, close to our residence in Santacruz. We’d highly recommend it – everything from interiors to the menu was perfect. We came across Jade Garden in Worli after a lot of searching. The hospitality and catering were on point and that makes all the difference to the festivities. We hosted our wedding at Mayfair Banquets in Worli. My brother, my cousins, they’ve all been married there. It’s a huge venue and perfect to accommodate the large gathering we were expecting. The hospitality and décor sets them apart! We were very happy with our choice. The mehndi and mata ki chowki was a combined function. We wanted to personalize a traditional aesthetic so we segmented the venue. In one area we set up a stage for the idols. In another, the bridal setting featured a floral canopy for me to sit under. We also had a table full of mehndi giveaways such as rings, mangtikkas, bangles, bracelets, etc. 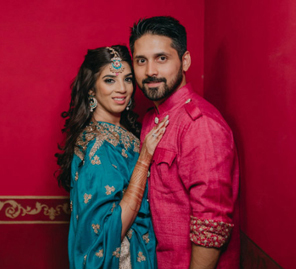 For this function, I wore an asymmetrical emerald green kurta with a sharara and dupatta by Jay Makhija while Dhiren opted for a baby pink kurta and bandi. Team Vivaah planned and executed the décor for the sangeet. The palette was black, gold and red. The entrance was done up with red floral chandeliers and light elements. They created a bar with bulbs and crystal hangings. Our dance floor carried a black and gold pattern. And we were set for an amazing night! I wore a beautiful ice blue lehenga by Caipiroska for this event and Dhiren opted for a Blue Bandh Gala with silver asymmetric kurta & trousers. Team Eventshoppe was in charge of the decor at Mayfair Banquets. On arrival, our guests could see the foyer lit with crystal lamps surrounding our hashtag #DhiNChaK, spelled in marquee lights. Inside, we had a mandap in the center of the ballroom and our seats read “His forever” and “Hers forever. We handed out cones filled with petals to our guests at the time of the pheras. Our reception was an extension of the wedding so the set up remained almost the same with a few tweaks in lighting. I wanted to wear an all red ensemble for the wedding so I picked a lehenga from Siyaa in Kolkata. For the reception, I changed into a taupe trail gown by Caipiroska which featured rose gold embroidery and pearl and feather embellishments. The internet is such a great tool for drawing inspiration for your wedding and I encourage couples to make the most of it while planning their big day. My wedding was planned entirely by my family and I. WeddingSutra was a great inspiration. Take your time to finalize on things and ensure every minute detail is taken into consideration. To keep a track of all that needs to be done, make a checklist for yourself. Finally, stay calm no matter what. Don’t lose sleep over little things. Everything will fall into place and your day will be perfect.